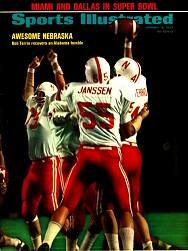 Defensive tackle Bill Janssen was a two-year standout on the Blackshirts and a 1972 co-captain. 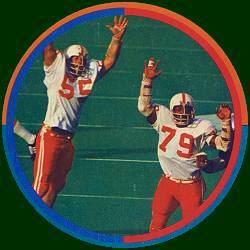 A fine defender against the run and a tough pass rusher, he was one of the most versatile Huskers, playing defensive end, offensive guard and center before taking over the No. 1 defensive left tackle spot in 1971. There, he played alongside the likes of Outland winners Larry Jacobson and Rich Glover and All-Americans Willie Harper and John Dutton. 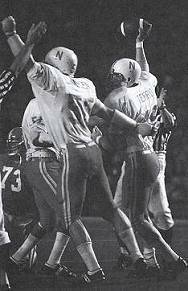 After coming to Lincoln from Grand Forks, N.D., he lettered on the 1969 team, then sat out 1970 with a broken arm. He was an eighth-round draft choice of the Pittsburgh Steelers in 1973.
the front of the Sept. 11, 1972, issue.